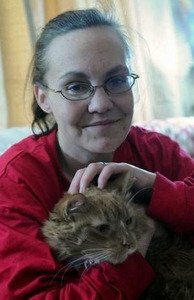 According to the Green Bay Press Gazette, a Sturgeon Bay, WI, woman’s pet cat saved her life. Amy Jung, who’s had diabetes since she was 4 years old, had a seizure while sleeping. Pudding, Jung’s 21-pound orange-and white cat, sensed something was amiss and jumped on his owner’s chest. When that did not awaken her, the cat swatted Jung’s face and bit her nose. Had Pudding not intervened, it could have been fatal. The woman awoke and called her son, Ethan, for help. When the boy did not respond, Pudding ran into his room and woke him up. Ironically, Jung almost didn’t get Pudding’s wake-up call — or Pudding for that matter — as she unexpectedly adopted the cat from the Humane Society earlier that same day. Initially, Jung had no intention of getting a cat, but she changed her mind after she saw Pudding and another feline named Wimsy. She adopted them both. Pudding helps Jung on a day-to-day basis to treat her diabetes: when her blood sugar gets low, as he parks at her feet and meows. Jung is the cat’s third owner; Pudding’s first had to give the cat up because of allergies, and his second died.